Ride in any shoe with comfort and control. Classic styling with an extremely durable design; perfect for city riding and general commuting. Extra-wide platform offers great support for every size of foot. Compatible with toe clips and straps (not included). Cromoly spindle. Standard 9/16" threading. 395g/pair. Made in Japan. I replaced the Shimano A-530 (SPDPlatforrm) pedals on my commuter bike with these. My commute is less than 5 miles, with lots of traffic lights, so I never wear shoes with cleats anyway. Having access to both sides in street shoes makes for a much easier commute. These are very solid, very well finished. I've been riding them for several months in rain, and now snowsalt, and they still look like new. Good grip with street shoes or Showers Pass booties. They're very traditionally shaped, so they don't distribute weight quite as well as a bigger platform. They're comfortable enough, don't weigh a ton, and don't have any sharp edges. This is the third set of Sylvan Touring Pedals I have bought. I use them on grocery-getter and commuting bikes I have set up for myself, my wife and a friend. I like to use them with Power Grips foot retention straps so that I can ride in any kind of shoe and have more power than with pedals alone. 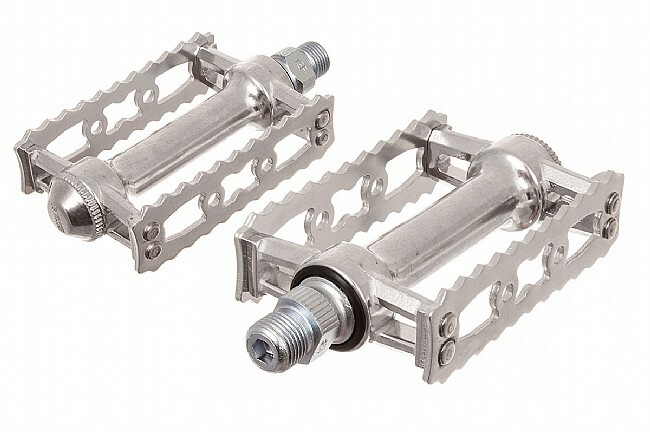 These pedals are the best for that type of system because the little serrations on the edge of the pedal hold on to my shoes, even Converse shoes, yet the serrations are not so big that I feel them when I are pedaling in thin soled shoes. The other awesome thing about these pedals is that they last for ever. I have just beat the crap out of mine over the last 5 years and they still pedal nice and smooth. These pedals are decent and solid enough for what they are, but a poor value compared to the MKS Sylvan PRIME pedals available from other vendors. The primes have a better finish quality and appear to have better materials and workmanship than these. In any case, if you do get these, be prepared to open them up, grease them properly, and adjust the bearings before installation. Straight from the tin these are very rough, barely lubed, and not adjusted to spin smoothly. Thanks for your feedback! It's true that the Sylvan Tourings are a budget-oriented pair of pedals, and lubing and adjusting new unsealed pedals is never a bad idea to get the most life possible out of them. It took me years to finally complete the Cyclist's pedal circle of life (Platforms - Toe Clips- Clipless-Back to Platforms). But when I did, I looked around for a good pair of platforms. Most available are rather flimsy or the burly DH/BMX style, none of which suited my needs for a light, stable and well built platform pedal for racing/speed riding. Finally a touring friend of mine recommended these. I ordered them as they were cheap enough and when they arrived I didn't have high hopes. The packaging was a minimalist (a plastic bag), no flashy packaging, no user manual, nothing. I put them on with some skepticism. That was two years ago. This thing is the best kept secret in the industry! I have now put them on all my bikes. Rock solid and stable and they can be taken completely apart and serviced. I highly recommend these. FWIW they are Made in Japan. Gorgeous. They feel strong under your foot. The pedal rotates around nicely and the bearings feel substantial (no grinding). Not harsh on the shoes (some pedals really dig in and destroy the shoes). Does not hurt your leg if they should hit your shin, but also hold your foot in place when pedaling. Both sides of the pedal are the same so there is no need to look down to find the correct side. Pleanty of space for your toes. You wear normal sneakers/shoes. And last, not expensive. The only pedal I will purchase from this point forward. These are excellent for roadtouring, Great with toeclips and straps. Very lightweight and good looking as well. Used on all my touring and road bikes. I don't like clipless and these provide excellent grip on virtually any soles. Not being happy with the original stock plastic pedals, I replaced them with these. A MAJOR step up (no pun intended) as these have a more agressive bit to the platform meaning that my feet don't slip anymore! Work well after you adjust the ball bearings inside. Decent quality pedals, but I think the manufacturer has the bearings on too tight. As a result these pedals do not spin very freely and spin with some resistance that is noticeable. You can fix this yourself if you are familiar with working with loose ball bearings and cones. It took me about half an hour to do both pedals. As another reviewer did I unscrewed the caps, added more grease, and put the ball bearings back in put didn't screw on as tight to relieve pressure on the bearings. They now work fine, but would be nice if they were better adjusted out of the box. Work as intended, but when standing up, more platform would be nice. Of course more platform adds weight, but might be worthwhile tradeoff. Still, good value for money,and seem reliable after few months of use. For the money, MKS seems to have the best pedals. I have these on one bike and an older pair of track pedals on my other bike. Both work solid, bearings are smooth etc. My only complaint is they seem a bit longer and stick out more than most pedals. They were prone to hitting the ground on tight turns with my fixed gear. Bought wife a new high end road bicycle. New experience for her for sure. She didn't want to mess with toe cages or clipless quite yet, but wanted pedals as easy to find with her feet as are on her comfort bike. These fit the bill perfectly. Bearings are excellent and they are light enough. I've been using MKS Sylvan Touring Pedals for years now on my commuter bikes. I wanted something high quality, durable, and simple. These are all that. I typically find that when they arrive they are adjusted rather tightly, which makes them seem a little rough-turning. This is purely an adjustment issue. I don't know if that smooths out in use because I've always just unscrewed the caps, replaced the grease, and adjusted them to be tight enough to remove all the slack and still spin smoothly and freely. So 5 stars for a great product but -1 star for the bearings being adjusted so tight out of the box. I COULDN'T USE THE PEDALS BECAUSE I DIDN'T CHECK FOR THE CORRECT SIZE THREADS. 11 of 16 customers found this review helpful. These pedals would be good without toe clips or Power Grip Straps. I use them on my Rivendell Redwood 68 cm sport touring bicycle and my Rivendell Atlantis2 68 cm touring bicycle. I had the Atlantis2 built with Phil-Wood Hubs & Bottom bracket. Why Phil? Because you can field service them on tour yourself. I think they are a quality no nonsense pedal with smooth bearings. They not for racing or sharp cornering with long crank arms like I have. They are great for touring or riding to work or bicycle path riding.